Paolucci's! Photo courtesy Atchison Chamber. Spaghetti! Photo courtesy Atchison Chamber. Shrimp pasta dish. Photo courtesy Atchison Chamber. The famous and mysterious Guiseppe Burger. Margie says it's made from a secret recipe! Photo courtesy Atchison Chamber. Paolucci desserts! Photo courtesy Atchison Chamber. Lounge area. Photo courtesy Atchison Chamber. Banquet room. Photo courtesy Atchison Chamber. Open Monday-Saturday 6 a.m.-9 p.m.
Paolucci's Restaurant is a finalist for the 8 Wonders of Kansas Cuisine because they've been serving Italian recipes since 1983 that came to America with Grandma Paolucci in 1894. Paolucci's Italian Dinner consists of a generous serving of spaghetti or rigatoni topped with your choice of meatballs, Italian Sausage or meat sauce. A full order is $7.99. A Taste of Italy is a combination of meat sauce, Italian sausage and a meatball served over spaghetti or rigatoni. Lasagna, Spinach Lasagna, Linguine with Alfredo, and Shrimp Scampi over Linguine are the other pasta dishes. The Guiseppe Burger is a fresh patty, seasoned with the secret Paolucci sauce, and served on toasted bread with a side of Marinara. Other Italian sandwiches include the Italian Breaded Steak and Italian Sausage. They also serve American classics. The restaurant's Italian recipes came from Grandma (Rosa) Paolucci, who came from Italy in 1894 to open the fruit market with her husband Dominic and his brother Felix. They came to Atchison from Frosolone, Italy, a small town just north of Naples. Dominic and Rosa had three sons, Nick, John, Felix and one daughter, Mary. All but Felix, who left for a Navy career, worked in the family business. In 1979, Mike Begley and his wife Margie purchased the grocery, along with the whole building from Mike's mother Mary. Mary continued to work in the grocery until she was 87 years old. She died in 2000. They still make up the spice bags for the meatballs and spaghetti sauce. Don't ask for any recipes! They are secret. Another secret recipe handed down from Uncle Johnny is that of the ham salad. The residents and staff of Village Villa of Nortonville were the judges for a ham salad contest in the area. They awarded Paolucci & Begley Deli with having the best ham salad in Atchison! Though the Paolucci family has been in business since 1894, Paolucci's Restaurant opened in 1983. This Italian/American restaurant now has a fifth generation working in the family business. Jacks cafe, in the North side of the building was in operation for more than 60 years under three different owners. In October, 1982, it closed and Mike and Margie remodeled it and opened it as Paolucci's Restaurant in February 1983. In April 1990, we remodeled the upstairs to make Paolucci's Lounge. The rooms above the grocery and restaurant were rented for many years. Since we were only a block away from the passenger train station, the rooms were always full. Jack's Cafe and the grocery store used to stay open late to accommodate late arriving passengers. They closed the train depot in the late 1960s. Mike and Margie's oldest son, Ed, manages the lounge and helps with the whole business. His son, Michael, is a host and waiter in the restaurant making this a fifth generation business. A banquet room is on the south side of the building that was remodeled and opened in 2002. Marge says the building is a bit like a maze, it just keeps going on and on. In fact, Mike and Margie live above the store behind the lounge. Mike has lived there all but eight years of his life. 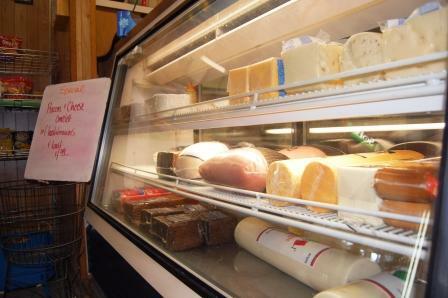 Paolucci's also have a deli. Photo courtesy Atchison Chamber.